Arun Karthik was named Man of the Match and Series. 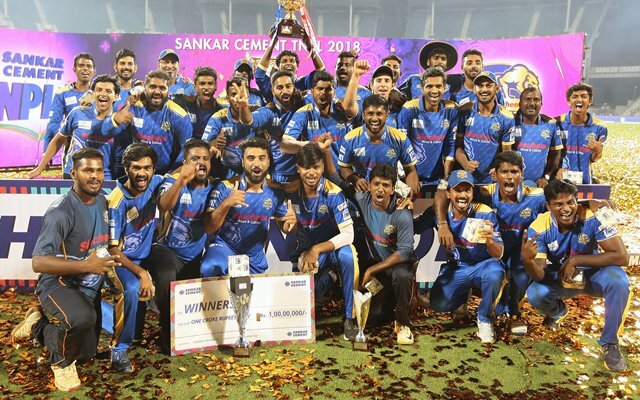 Siechem Madurai Panthers, who were winless throughout last two seasons, completed a miraculous comeback this season with the seven-wicket win in the 2018 Sankar Cement-TNPL final against Dindigul Dragons at the MA Chidambaram Stadium, Chennai on Sunday, Aug 12. In the clash billed as ‘Dindigul Dragons batting against Madurai Panthers bowling’, Panthers’ bowling attack knocked out the heavy batting line-up of the Dragons very early in the game and skittled them eventually for only 117. Panthers had a poor start in the chase as Dragons’ left-arm spinner M Silambarasan conjured a triple-wicket over first up. The experienced duo of KB Arun Karthik not out 75(50b,4×4,4×6) and Shijit Chandran 38(49b,3×4,1×6) stepped up for the Panthers and steered the team upwards with an unbeaten 117-run partnership. Arun Karthik registered his sixth fifty of the season and remained the highest run-getter in the tournament. Earlier in the night, choosing to bowl first, Madurai Panthers’ bowlers were on fire from the first over itself as Abhishek Tanwar castled Dragons’ opener Hari Nishaanth for one. The Dragons lost a wicket each in every over till the fifth and were languishing at 33-5 by the end of Powerplay overs. Captain N Jagadeesan waged a lone battle for the Dragons with the fighting knock of 51(44b,5×4,1×6). Medium-pace bowler Abhishek Tanwar became the highest wicket-taker of the 2018 Sankar Cement-TNPL with his four-wicket haul (4-30) tonight, he was extremely well supported by another medium pacer Lokesh Raj (3-31) and the miserly mystery spinner Varun Chakaravarthy (2-9).